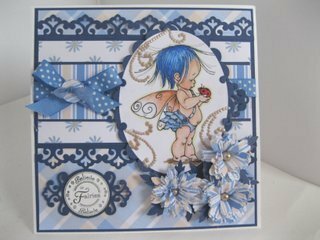 I love to add flowers to my designs and you will find many tutorials on the website on making them in various ways. are just a few more flower ideas for you to try. But if you are collecting Spellbinders then this may be another die that you want to add to your collection. Or perhaps you have already bought it and you have been disappointed with the result ... as the die has not produced the sort of flowers that you thought it would. There is nowhere on the packet that tells you how to make them and so it is trial and error until you get the effect you want .... or maybe you have simply discarded the die in sheer frustration. Well despair no more because I am here to show you how and I have done some "trial and error" for you. This is the way that I make the flowers and it could work for you too. This short Spellbinders Bauble Blossoms video will give you the guidelines that can help you to make some beautiful blooms for your cards. 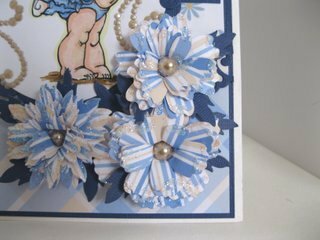 I have used three of the blooms on this card from each of the different dies and the flowers are all sprinkled with Glamour Dust. The effect with the pearls was a happy accident but I liked the look once it was done... and I included it on the tutorial in case you like the look too. If you are stuck over colours then take a look at two videos that will show you how to blend colours and patterns together in a way that pleases you. That is the first video that will send you on a journey of discovery into these fabulous dies and once you start collecting ... you won't stop ! !